SQL Profiler is a tool which every respected DBA should use. It is a tool to analyze performance, analyze what a kind of queries are executed by an application etc.... 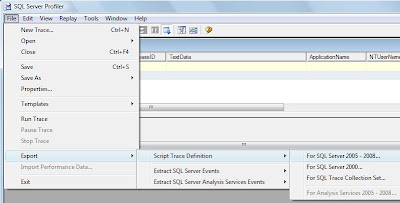 Without the SQL profiler application, you can still make profile traces. This is possible via SQL Server Management Studio (SSMS). Now I will show you a script which I uses a lot with some additional comments and an automatic stop of the profile trace of 1 minute. After starting the trace you get a TraceID. This TraceID is needed if you want to stop the trace before the endtime has occured. For instance, you want to stop a trace after 5 minutes but the @Endtime is configured for 30 minutes.